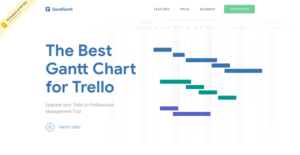 GoodGantt is a Gantt Chart Software designed specifically for Trello, providing Trello users with a comprehensive set of Gantt charts and capabilities to streamline and simplify the way they manage their projects, tasks, personnel, and resources. It puts all boards of the user’s Trello account into a single, unified location for easy and efficient management. This project management software integrates seamlessly with the world’s most popular and widely used time tracking solutions, allowing managers to closely monitor their employees’ working hours and performance. Tasks are easily assigned and task cards can be customized. All cards are automatically moved whenever there is update or development in their progress. With GoodGantt, managers have a clear, 360-degree view of their team’s workload. This helps them distribute tasks evenly based on hours or task availability. GoodGantt provides you with a platform where you can put all your Trello task boards in a single location, giving you unmatched visibility on all your projects and tasks. Having such a view of all your projects allows you to make critical decisions and actions, respond and make the necessary adjustments to ensure all priorities are manned and all essential tasks are accomplished timely according to client specifications. Many businesses have lost money because they fail to maximize their time and pay employees even when they are unproductive during working hours. WIth GoodGantt, you can integrate it with popular time tracking systems and applications to help you closely track your team’s working hours and analyze their performance to see what is hampering their productivity and what can be done to boost their efficiencies. You can modify your columns to display all your tasks based on your preferences. A progress column details all the tasks that are currently in progress, while the completed column displays all tasks that are marked as “Finished” or “Completed”. It helps you prioritize your tasks and make the adjustments whenever the need arises. Efficiency is a delicate thing to manage but one that can be achieved on a consistent basis if tasks are evenly distributed. With GoodGantt, you have a complete view of all your team’s workload. You can see who is available and who doesn’t have tasks assigned to him. You simply take a look, create and assign tasks to ensure that everyone is working but not overwhelmed with their responsibilities. What Problems Will GoodGantt Solve? Everyone loves Trello but when projects become too much planning ahead, things get harder. GoodGantt provides the best solution for accounting for the work of employees and load sharing between employees at an affordable price and fast work speed. It is essential to note that hardly any service in the Project Management Software category is going to be an ideal solution able to match all the needs of different business types, sizes and industries. It may be a good idea to read a few GoodGantt reviews first as specific services might perform well only in a really small group of applications or be created with a really specific type of industry in mind. Others might function with an intention of being simple and intuitive and as a result lack advanced functionalities needed by more experienced users. You can also come across software that support a broad group of customers and provide a powerful feature toolbox, but that usually comes at a higher price of such a service. Be certain that you're aware of your requirements so that you purchase a solution that has all the functionalities you search for. How Much Does GoodGantt Cost? We realize that when you make a decision to buy Project Management Software it’s important not only to see how experts evaluate it in their reviews, but also to find out if the real people and companies that buy it are actually satisfied with the product. That’s why we’ve created our behavior-based Customer Satisfaction Algorithm™ that gathers customer reviews, comments and GoodGantt reviews across a wide range of social media sites. The data is then presented in an easy to digest form showing how many people had positive and negative experience with GoodGantt. With that information at hand you should be equipped to make an informed buying decision that you won’t regret. What are GoodGantt pricing details? What integrations are available for GoodGantt? GoodGantt is deeply integrated into Trello and also integrates with the best time trackers. If you need more information about GoodGantt or you simply have a question let us know what you need and we’ll forward your request directly to the vendor.